What Is Lightly Scored Chicken? Some recipes call for lightly scoring chicken, which increases the surface area and allows marinades and rubs to penetrate further into the meat. This technique should be used with short marinating times because longer marinating on scored meat could affect the texture of the meat. Scoring is used most often on meats with a layer of fat, such as a ham or duck, but the technique translates well to chicken. Scoring chicken results in more flavorful, tender meat with a crisp skin. Marking the surface of the chicken skin or meat with shallow cuts is what is known as scoring the chicken. 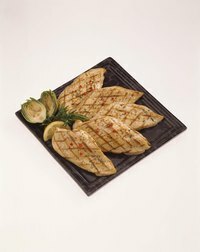 Lightly scored chicken has a pattern of cuts that penetrate just below the surface of the skin or meat. Recipes often request that the chicken be scored to separate the skin from the meat in several places and to allow flavors to penetrate below the skin. When the skin is lightly scored, it releases fat below the skin and results in a crisper skin. Scoring chicken before marinating or seasoning it allows the seasonings into the cuts, coating more surfaces. Use a sharp knife to make parallel, shallow cuts through the chicken skin. On skinless chicken cut lightly into the meat. When scoring boneless chicken, score both sides of the meat. Make the cuts approximately 1/8 inch deep and 1/2 to 1 inch apart, unless your recipe specifies differently. Rotate the chicken 45 degrees and make a second set of cuts, resulting in small diamond-shaped cuts across the surface. Chicken that has obvious grill marks is often referred to as "scored." When the term is used in this manner, lightly scored chicken has light brown grill marks. To score chicken in this way, the grill must be hot enough to brown the chicken where it touches the grill. The meat is put on the grill at an angle and allowed to cook until grill marks are visible, then turned 45 degrees and allowed to cook on the same side until the grill marks cross before turning it over to brown the other side. This treatment is purely for appearance and is done on the side of the meat that will be served facing up.